The Department of Transportation provides guidance on accessing bus and rail service with a document called: Questions and Answers Concerning Wheelchairs and Bus and Rail Service. 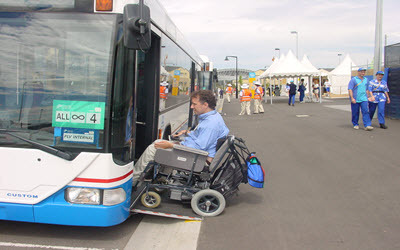 Some people with disabilities are unable to navigate the fixed-route bus and train systems on their own. The ADA says public transit agencies must provide paratransit service to people with disabilities who are unable to use the fixed-route system. To learn how to advocate for your rights to paratransit (door-to-door) service, read our guide called ADA Paratransit – How to Make Your Case (Word Document). The ADA does not cover airline travel. Instead, these issues are covered by the Air Carrier Access Act (ACAA), enacted in 1986. The act says U.S. and foreign air carriers may not discriminate against air travelers with disabilities. For more information, the Department of Transportation has published a manual on the Air Carrier Access Act called: What Airline Employees, Airline Contractors, and Air Travelers with Disabilities Need to Know About Access to Air Travel for Persons with Disabilities.